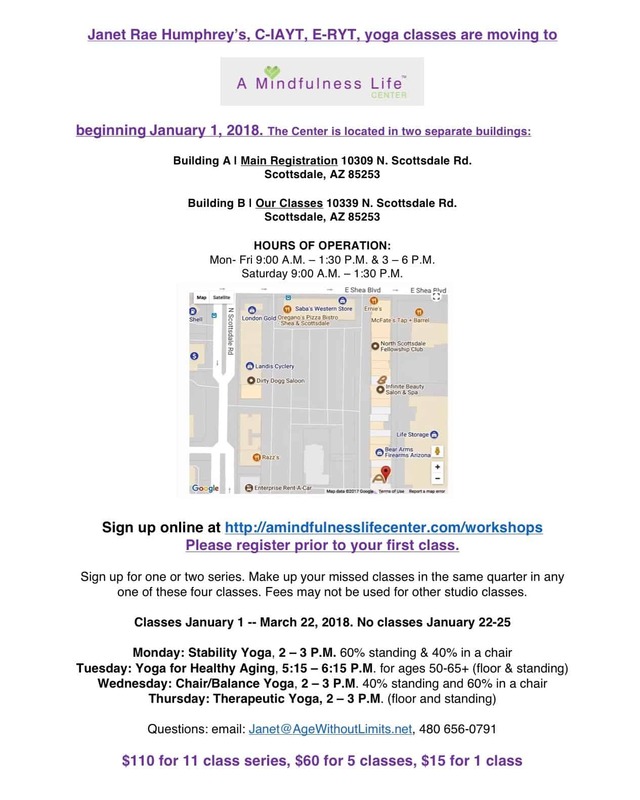 Classes for January through March will start at A Mindfulness Life Center on December 31, 2018. We will have 13 weeks of classes. You may come to any of the three classes. Contact me with any questions: Janet@AgeWithoutLimits.net. I came up with Football Referee yoga poses when I had more men than women in my class. Everyone enjoys this sequence and the poses became a chapter in Age Without Limits. You can watch 3 minutes of these poses by connecting with the link below. 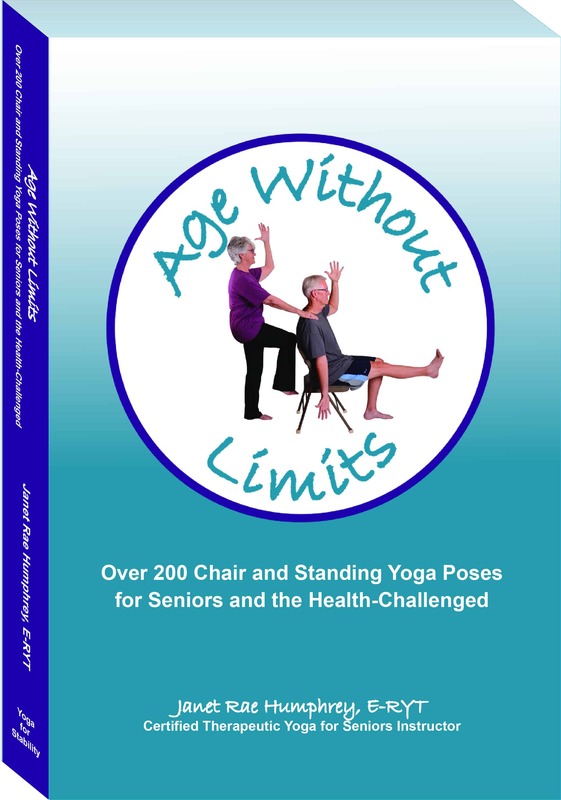 All the poses are found in Age Without Limits which you can order from Amazon or buy at A Mindfulness Life Center, Building A: 10309 N. Scottsdale RD, Scottsdale, AZ 85253. 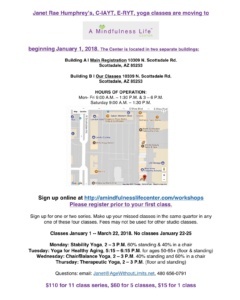 Classes are in Building B: 10339 N. Scottsdale RD, Scottsdale, AZ 85253. Please email me at Janet@AgeWithoutLimits.net with any questions. Tuesdays at 5:30 – 6:30 p.m. in Studio B. For more information call 480:207-6016. 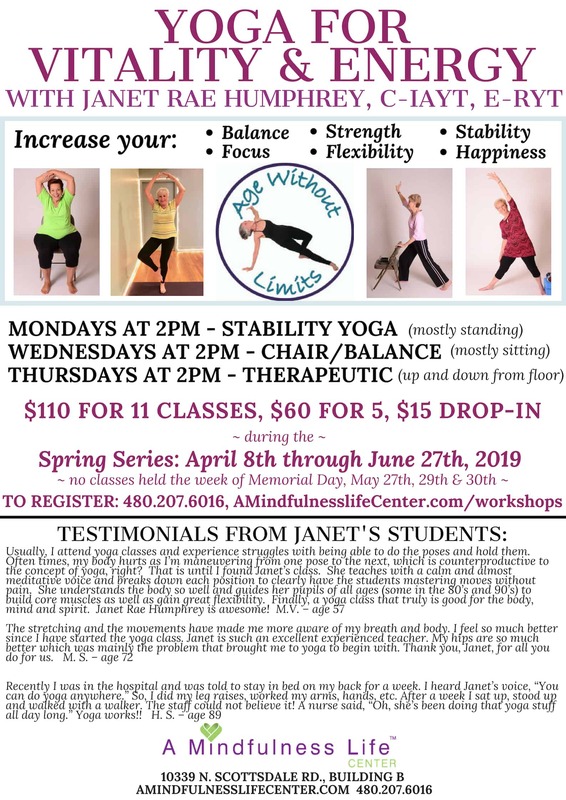 Janet@AgeWithoutLimits.net or call 480 656-0791 between 5 and 9 p.m. 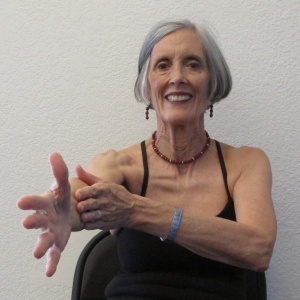 I was overjoyed with the wonderful review of Age Without Limits just posted by www.YogaUonline.com. 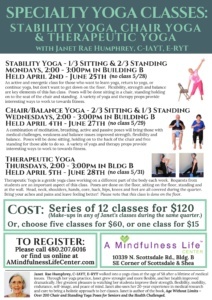 Amy Kraft and I formed Senior Yoga Pros to help train people to teach chair yoga to seniors. 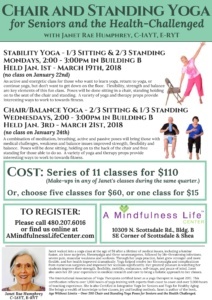 We have a vision of every person over 60 in the United States having an age and level appropriate yoga class available within 30 minutes of their home. Help us fulfill this vision by enrolling in Chair Yoga for Seniors and the Health-Challenged on October 19-22, 2017 in Scottsdale, Arizona. Go to the Teachers tab above and click on Yoga Teachers for more information. Please write to us at Pros@SeniorYogaPros.com for more information. 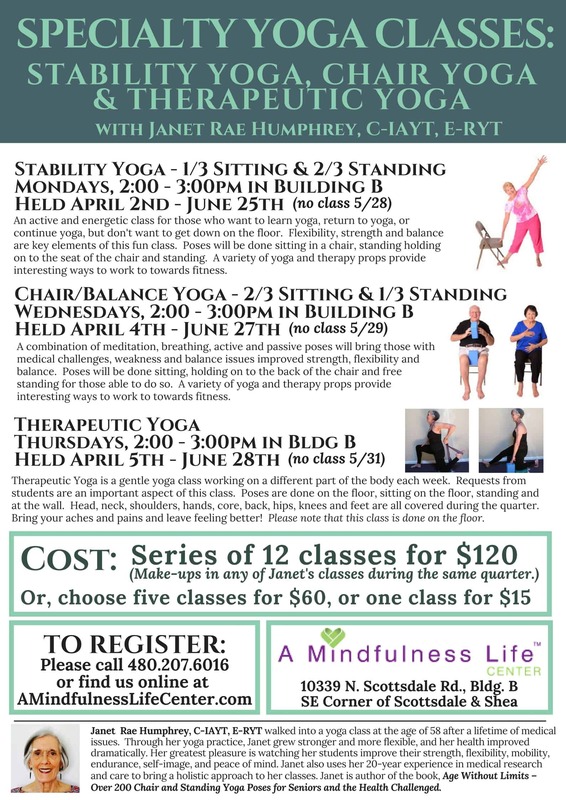 Seniors deserve a great yoga class taught by YOU! 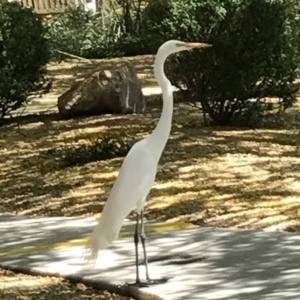 This magnificent Great Egret stood in the front yard of Sunrise Scottsdale Assisted Living as I drove up to teach my Wednesday chair yoga class. I was a few minutes early and was able to sit there an enjoy the bird as it stood still, walked, and looked around. 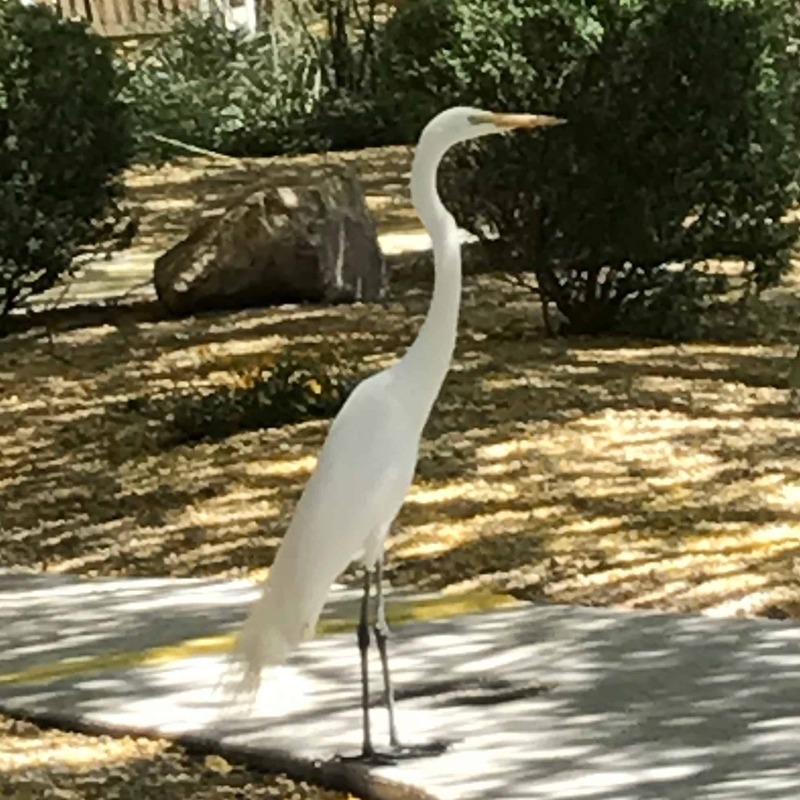 The street traffic and a couple in a nearby bench did not distress this bird as it basked the beautiful spring weather. At the beginning of the class I asked the students, whose faces lit-up as I showed them the bird’s picture, how they would describe this bird. Then I asked my chair yoga students to sit in mountain pose showing the same qualities as this bird. They responded and showed a new admiration for themselves. The same command was given throughout the class. After class I again asked them to leave and walk into the lunch room with all the above characteristics. When you are over 70, have some cognitive impairment and, maybe, don’t think too highly of yourself, these elements are critical. May you stand in mountain pose with majesty, dignity, grace, stateliness, confidence, height, class, pride and elegance. Age is NOT a Four-Letter Word! Age Without Limits was one of two textbooks for The Art and Science of Teaching Chair Yoga – Age to Wellness. 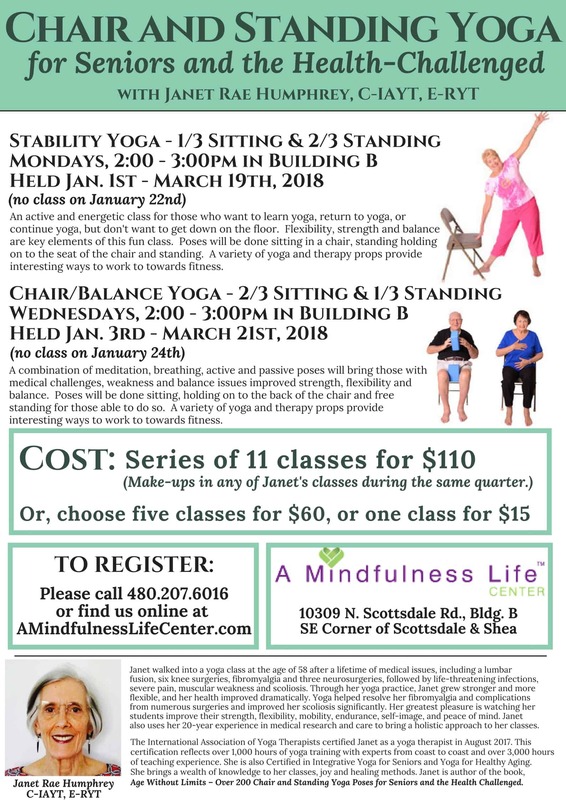 Last October, I attended a yoga workshop entitled, “The Art and Science of Chair Yoga – Age to Wellness” tailored for teaching yoga to adults ages 50 – 100. 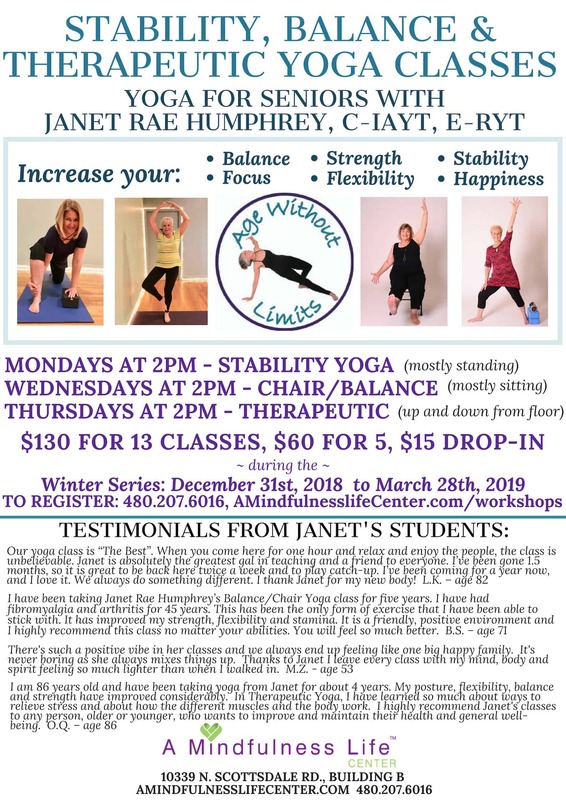 I met two vibrant and inspirational women, (Janet Rae Humphrey, E-RYT and Amy Kraft, E-RYT) passionate about giving senior students wellness through yoga. I had the opportunity to observe them both teaching women and men in their sixties through nineties. One class in particular was a revelation; the ladies began the class in chairs, but progressed to powerful flowing standing poses. Their stamina was revelatory. Their joy was palpable. There was a sense of camaraderie and playfulness, manifested by joking and easy laughter. Teacher and students moved with graceful precision and focus. Each glowing face was more proud and beautiful than the next. After class, the students shared how long they had been doing yoga and how it helped them. They reported improved balance, flexibility, and strength. They found pain relief for various chronic conditions such as arthritis. They also talked about coming to class to be with friends to have fun. Finally, each person thanked the teacher for her respectful guidance and compassion. I was profoundly moved and inspired by teacher and students. 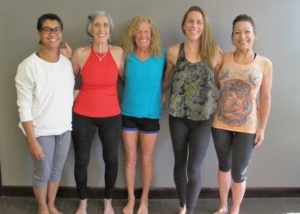 As a yogini dedicated to teaching baby boomers and beyond, the workshop further reinforced for me the numerous benefits of yoga to our growing aging population. Yoga is a safe way to stay healthy because the practice can be adapted to meet the physical demands of aging. Yoga also alleviates mental and emotional stress; the yoga practitioner is more capable of coping with change, such as loss and loneliness, more commonplace as the years progress. Yoga teachers can offer gentle adjustments in class to offer both physical support in poses and emotional support through touch to connect to the student. But most of all, I witnessed determined women who are comfortable in their bodies. They embody wisdom and prove that growing older can be approached with acceptance and dignity. One student, who had never been physical and as just started yoga, proved it is never too late to start practicing to choose health. A young friend once told me he saw death when he was around seniors; I see life. 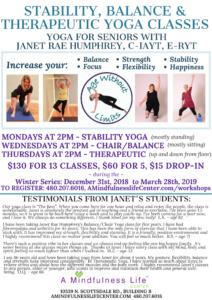 “Grow Old with Yoga” in May/June 2016 Yoga Digest tells Janet’s yoga story of recovery from major health problems, her writing this book and more information about yoga for seniors from three of Janet’s teachers. Here is a link to the YogaDigest article. 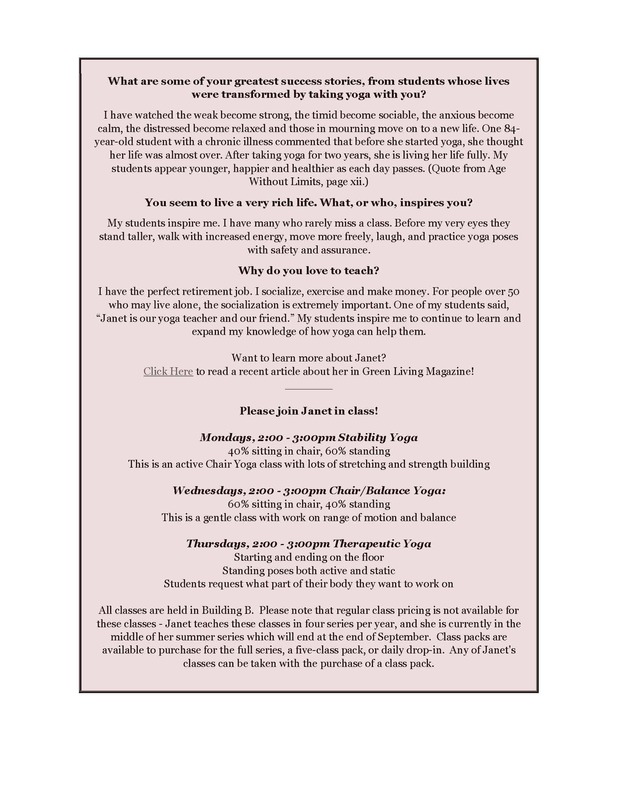 You can also read about the Art and Science of Teaching Chair Yoga Workshop Janet and Amy Kraft, of BoomerPlus Yoga, will be doing in October under the Yoga Teacher tab above. Don’t tell my students in their 80’s and 90’s that they are old. Order Age Without Limits by going to the Order Book tab above and start practicing yoga soon. 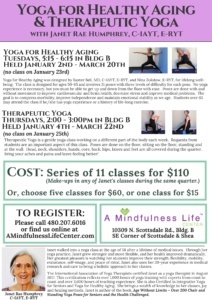 Sign up for my classes that are listed under the Seniors and Health-Challenged tab above. Email me with any questions under the Contact Me tab above. Six five-star reviews have been posted on Amazon.com. How thrilling it is to see Age Without Limits benefit a variety of individuals. It is time for you to feel better too. Get you copy today. I’m 65 years old. In October of 2015 I took up spey fly casting. Since then I’ve tried to practice daily. I began to have shoulder pain such that I curtailed practice, even when taking ibuprofen, and needed to give up certain casting forms. About a month ago I came across Age Without Limits, started doing the shoulder poses, and found instant relief. Within two weeks I was back to full practice sessions and no ibuprofen. I waited a month to write a review to make sure the improvement persisted. It not only has, it continues to get better. I experience very little discomfort now, have a much wider range of motion than I’ve had in years (decades? ), and hope soon to return to all the casting forms. Thank you Janet Rae! Age Without Limits is the consummate chair yoga book– Plus there are exercises for standing by a chair, using the wall, as well as suggestions for various health issues and more… As a therapeutic fitness and yoga specialist, I recommend this book to healthcare professionals, educators, bodyworkers, caregivers, younger family members, and of course older adults!!! Actually, everyone can discover specific exercises illustrated with instructions to support and enhance their quality of life! Janet has put together a comprehensive book that includes background information on the health benefits of yoga for older adults. Her pictures of the poses are very clear and easy to follow. The testimonials of her students are inspiring. I will be working with my husband to use the poses as part of his rehabilitation after his total knee replacement. This should be fun to do together. This book is wonderful! As a yoga instructor, I reference this book often for teaching classes and feel that the instructions are easy to follow. I use it on a daily basis. The information is clear and concise, and the photos are extremely helpful. I highly recommend this book for students and teachers alike! 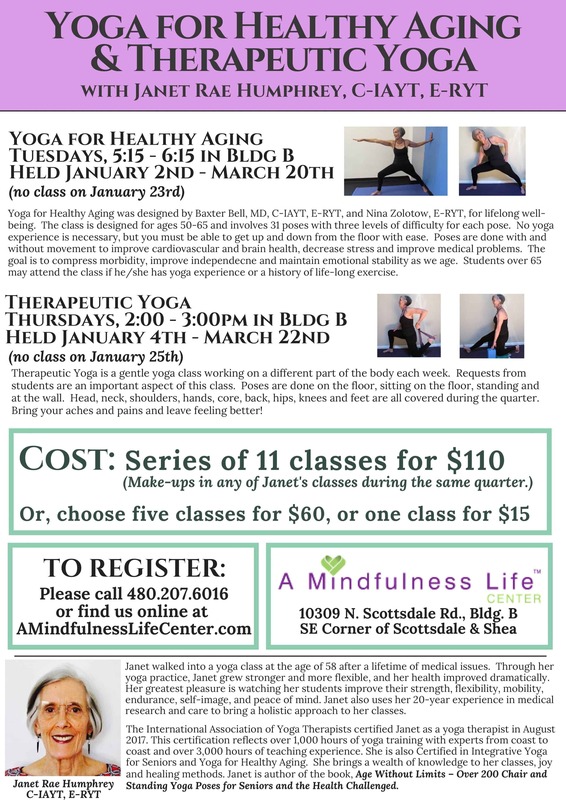 Janet Rae is a very knowledgeable and creative yoga teacher. She has given the yoga community a great gift with this one of a kind collection of uplifting, inspiring and safe ways for older adults to enjoy the many benefits of yoga. I highly recommend this book as it is loaded with great photos and endless ideas that anyone can follow. 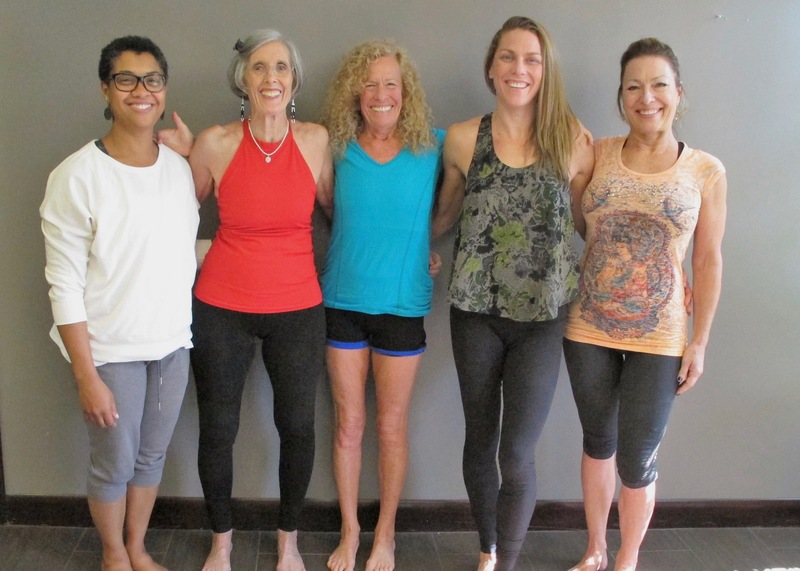 As a yoga teacher, many of my students are approaching or past the age of 70. This book promises to be a good resource of ideas to work with a population of students often overlooked in the ‘yoga culture’. It will also offer thoughts about posture and pose possibilities for my younger students. Glad I bought it.